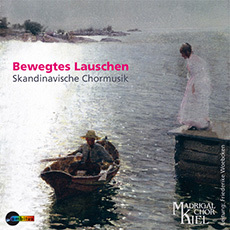 This recording introduces selected compositions from the immense wealth of Skandinavian choral music. Many of these works are highly popular repertoire pieces in their respective countries, as is the Islandic hymn „Heyr himna smiður“ or the „Sommarpsalm“ and „Kristallen den fina“ and „Pingst“ in Sweden. The Madrigal Chor Kiel under the directorship of Friederike Woebcken wishes to share their love of these "Nordic crystals" with their listeners and - to quote Nikolaus Lenau's poetical image - to move them to listen animatedly.